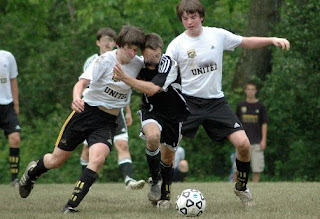 Last year, I was watching my older son, K-Man, play soccer in a tournament game with his United team. U17 select soccer is always rough and physical, but this game was more like a street fight. The ref for the game must have left his whistle, yellow cards and red cards in the car. He didn't call anything and as a result the violence escalated with each tick of the clock. At the start of the second half, one of our United players took out a kid with a hard slide tackle. It was not malicious, but it probably was a foul. The ref said, "play on, no foul." A few minutes later, a player from the other team retaliated by taking out a United player. The kid who was targeted didn't event have the ball and happened to be the only African American kid on the field. He was a speed player, not a physical player, yet he was targeted. I am pretty sure that it was racially motivated. No foul was called. The United parents were getting restless and very vocal about the poor officiating. A few minutes later, the same opposing player who took out the African American kid, flipped our best offensive player over his hip as they both battled for the ball. Our player fell awkwardly and ended up breaking his wrist. The ref finally issued a yellow card. The parent of the kid who was injured thought that a red card should have been issued and that player ejected. The ref and the dad exchanged words. Then the dad decided to eject the ref. He chased after the ref for a beat down. Luckily the ref was faster than the irate dad. The ref called the game a forfeit as he ran to his car. We lost. Tonight, the ref for my daughter's game did not blow the whistle either and this game also got out of hand. Nine year old girls can play some rough soccer too. My daughter's team ended up losing 1-0. My daughter, CC, scored a goal but the ref called a very questionable offsides and negated the tying goal. So I guess the ref did have a whistle. Later in the game, I politely asked the ref if she was watching the same game I was watching after my daughter was fouled right in front of me. I did not ride the ref for two reasons. 1) I didn't want to be the subject matter of my Crazy Youth Sports Parents Series and 2) she looked exactly like the actor Harold Ramis, who has made me laugh a time or two in movies like Stripes and Ghost Busters. 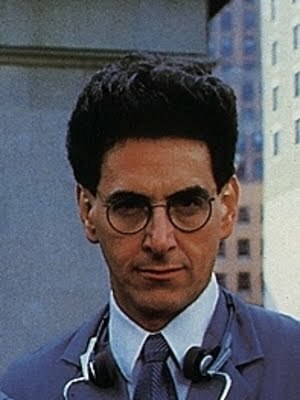 Harold Ramis is funny. Refs who let soccer games get out of control are not funny. Youth Baseball Game 23: My son Nic, had a baseball game also. My wife went to that game and kept me informed via my Apple iPhone. Nic went 0-1 with 2 walks. He was robbed by the center fielder who made a shoestring catch in right center near the wall. I was entertained by the reenactment this morning. Nic throw out one base stealer and had a tag out at home. Overall he was very happy. My main goal is to make sure he is enjoying the experience. I check the pulse on this often.